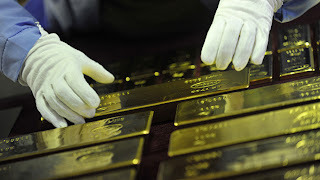 KIEV, Ukraine -- Ukraine’s gold reserves are estimated at more than 36.1 tonnes, according to the national bank, and is ranked 47 in world standings. In March Ukraine was 51 according to the World Gold Council. For the second consecutive year Ukraine is trying to diversify its international reserves and is actively buying gold on both foreign and domestic markets. However the price is turbulent and experts argue, whether the Central Bank should join in the rush or wait until the price settles. There have been reports Ukraine is going to start gold mining. Experts estimate Ukraine’s gold resources at 400 tons in the Carpathian Mountains and 500 tons in the Donbass region. Some gold is also believed to be in the Crimea and Dnepropetrovsk regions. Right now Ukraine has no gold production of its own and buys around 5 tonnes of gold a year. Domestic production of gold could start this year, the deputy head of National Bank, Vera Rychakovskya said. In three to five years Ukraine is expected to produce at least one ton of gold domestically and gradually increase capacity which will allow to cut imports by a third.